Many of my posts (like this one) support the little guy. I love to see the Davids defeat the Goliaths... unless the Goliaths are my favourites. In many ways this is a very biblical storyline. Weak, little, young David defeats strong, big, experienced Goliath by the power of God. God's strength comes into its own in your weakness. This really seems like biblical authority to cheer for the underdog. It justifies my dislike of the Yankees (MLB), Collingwood (Aussie Rules), Patriots (NFL) and Kentucky Basketball (NCAA). The last on that list is particularly pertinent today as the Kentucky Wildcats just completed an undefeated regular season of college basketball. Their 31-0 season makes them a unanimous #1 in the Associated Press poll and a prohibitive favourite to win the national championship. I find it all a bit boring really. Kentucky wins. Kentucky wins again. Oh, that's a close one... but Kentucky wins again. et cetera, et cetera, et cetera. Then I realised. 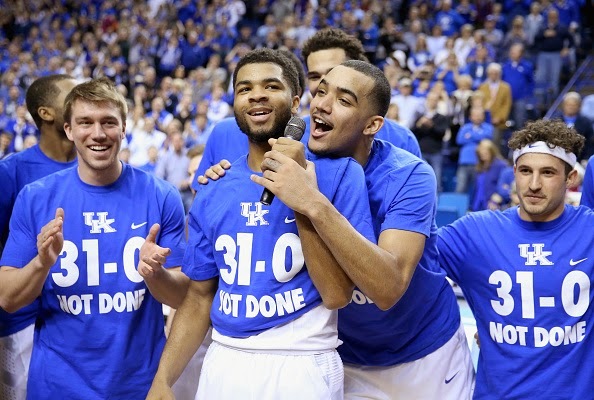 God is like the 2015 Kentucky Wildcats. He's big. He's dominant. He's undefeated. In Jesus, God defeated Satan. God defeated sin. God defeated death. And while we continue to play the game, the outcome is sure. God wins. Because we're on God's team, we win too. When Jesus hung on the cross it appeared that Satan was victorious, but Jesus came back from the dead and the result wasn't even close. Now we wait the final trumpet [buzzer] when we get to celebrate with Him. I don't always feel like a winner, so I need reminders that although I'm a David, God's even bigger than the Goliaths in my life. And I'm on His team. I still don't like Kentucky, but if they help me think of my God I can appreciate them for that. Life everlasting has victoriously swallowed death.